ZoneTag is a project from Yahoo Research Berkeley (YRB) that originally enabled Geotagging photos from your mobile phone and uploading to Flickr. Along the way, they also added the ability to tag these photos on your mobile, and you could always go back and tag the photos later yourself through the web interface. Through ZoneTag, and users developing their own machine-tagging strategy and finally Flickr fully supporting geotagged photos, Flickr ended up developing a large corpus of geographic-folksonomic tags describing a location. Services like Geocodr and YRB's own TagMaps created a geocoding service and map visualization of these tags. Yahoo released a ZoneTag API that provides access to their cell geolocation data, and also their Suggested Tags for your Location. This lets you fetch tags, as mined from the geotagged flickr photos, of tags that describe an area. For example, you could take a photo in downtown Ann Arbor, and ZoneTag may suggest other tags like "University, Wolverine, Conor O'Neils, Arbor Brewing Company, town, Michigan, SouthEast, ...". Which gets to my point - I developed a Greasemonkey script that adds ZoneTag to your Flickr photo editing page. It allows you to easily select and add ZoneTag suggested tags to your photo. To use it, just install the script (and Greasemonkey for Firefox if you haven't yet) and then navigate to a geotagged photo in Flickr. Click "Add a Tag", and now you'll see a new "Choose from Zonetags at this location". Click this, and after a short "Loading..." you should see a collection of tags that you can now click to add to your photo. 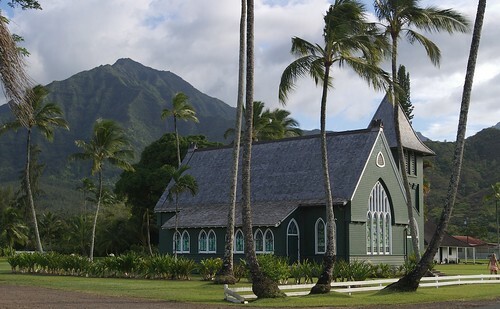 I found this really nice for my trip to Hawaii for adding all those "beach, palm, ocean, pacific" tags that I wouldn't necessarily have included, and also for getting names of towns and sights along the way (replete with many apostrophes such as Wai'oli Hui'ia Church in Hanalei Bay). Why this is exciting is because it allows a folksonomy cloud to build and reinforce itself. I may have some common tags I use for my own purposes of identification and sorting, but using ZoneTag I can also be introduced to other tag suggestions that describe my photo and make it easier for others to find and add into a larger body of classified photos. You should also check out the ActionTags functionality. You can register a callback service that is called when someone uploads a photo with a specific tag. This could be used, for example, to automatically apply other ZoneTags to your photos that you upload with a tag like "zonetagrme", or perhaps you are on a trip and want your friends emailed or photo added specifically to your blog when you post it with the tag "PhotoFlagHere". This is just the first kind of service that really makes web services interactive and have a broader functionality. ZoneTag is giving you a great infrastructure to enable all kinds of interaction between mobile devices, location, and other applications.